Today being the 152nd anniversary of the second day of the Battle of Gettysburg, I thought it would be fitting to add an article to my series on Massachusetts at Gettysburg. The 15th Massachusetts Infantry was among the most heavily engaged Massachusetts units on the second day of fighting (and the third for that matter). During the Battle of Gettysburg, the 15th Massachusetts belonged to 1st Brigade (Harrow), 2nd Division (Gibbon) of the II Corps (Hancock). It had been organized on June 28, 1861 and the bulk of the recruits were mustered in on July 12. It was a Worcester County regiment and the companies came from central Massachusetts towns such as Leominster, Fitchburg, Clinton, Oxford, Grafton, Brookfield, Webster and, of course, Worcester. They departed Massachusetts on August 8, 1861. In late August, the regiment became part of the Corps of Observation and was stationed at Poolesville, Maryland–about halfway along the Potomac between Washington and Harpers Ferry. Given this assignment, unfortunately, they played a significant role in the disastrous Battle of Ball’s Bluff on October 21, 1861, and a large number of the regiment was taken prisoner during the rout. They spent the winter of 1861-1862 in camp along the Potomac, were moved to Harper’s Ferry in February 1862, then in late March were transferred to the Army of the Potomac, arriving at the Virginia Pennisula by transport ship on April 1. They saw serious combat during the Battle of Seven Pines on May 31, 1862. Their role in the remainder of the Peninsular Campaign was minor–although under fire during the Seven Days Battles, they were kept mainly in support. When the Army of the Potomac was shifted to Northern Virginia during the Second Bull Run Campaign, the 15th Massachusetts arrived at Centerville in time to cover the retreating Union armies. Their worst ordeal came during the Battle of Antietam being a part of the ill-fated advance of Sedgwick’s Division which resulted in that large body of troops, inexplicably massed in closed column of brigades, becoming almost entirely surrounded and taking terrible casualties. The 15th Massachusetts, being on the front line of the advance, suffered 52% casualties. Although engaged during the Battle of Fredericksburg, they were kept mainly in support and their loss was slight. The same was true of their role during the Battle of Chancellorsville in May 1863. At the commencement of the Gettysburg Campaign, the 15th Massachusetts set off on the march on June 14, 1863. As was the case with virtually every unit in the Army of the Potomac during the pursuit of Lee’s Army into Pennsylvania, the 15th Massachusetts endured day after day of brutal marching. They crossed the Potomac on June 26. On June 29, the regiment marched, with their brigade, a grueling 30 miles over twelve hours to Uniontown, Maryland. One soldier in the regiment wrote that it was “the greatest march ever known.” On June 30, the regiment rested at Uniontown. On July 1, while elements of both armies began to clash 20 miles away in Gettysburg, the 15th Massachusetts resumed their march. The close of that day would find them bivouacked off the Taneytown Road near Little Round Top. They took into battle 239 men. The commanding officer of the 15th Massachusetts during the Battle of Gettysburg was Colonel George Hull Ward, then 38 years old. A native of Worcester, Ward was a farmer and active with the Massachusetts Militia before the war, commanding the Worcester City Guards for 14 years. When the 15th Massachusetts formed, he was commissioned lieutenant colonel of the regiment. During the Battle of Ball’s Bluff his left leg was shattered by a cannon ball resulting in an amputation just below the knee. Ward returned home to recuperate, was promoted to full colonel and acted as a recruiting officer in Worcester. After hearing of his unit’s terrible losses at Antietam, he determined that he would again take the field with them and took command of the regiment on January 31, 1863. In the dark of early morning on July 2, the 15th Massachusetts was ordered into formation and marched with their brigade to the center of the Union line on Cemetery Ridge. They reached a position behind Cemetery Ridge about dawn where they waited for some time and then were eventually placed along the ridge in front of the Leister House (Meade’s headquarters). They stacked arms and remained there until about 4 p.m. when Longstreet’s assault on the Union left flank began. 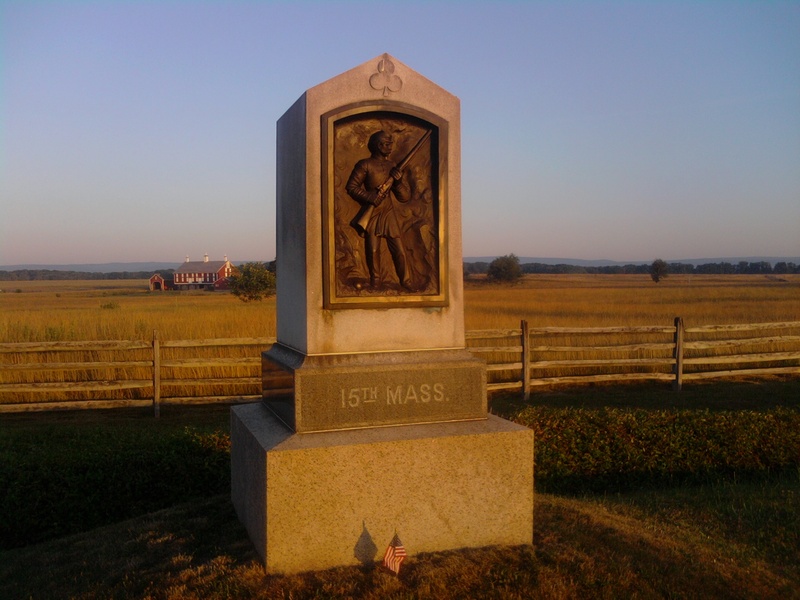 From their location, the men of the 15th Massachusetts could see elements of the Union III Corps take up their position along the Emmitsburg Pike and the Peach Orchard. And then saw them gradually begin to fall apart under the crushing attack. The right of the III Corps line along the Pike was in the air and exposed. The huge gap between the II and III Corps became even wider when Caldwell’s division of the II Corps was ordered south into the Wheatfield to support troops there. To help bolster the III Corps line to his front and left, General John Gibbon sent two regiments from his division to anchor the right flank of the III Corps. He chose the 82nd New York and the 15th Massachusetts. The two regiments marched through farm fields about a quarter of a mile to their front, stopping to the right (north) of a barn and brick house along the Emmitsburg Pike known as the Codori Farm. They positioned themselves there to support Battery B of the 1st Rhode Island Artillery. The 82nd New York placed their left on the Codori House. The 15th Massachusetts was on their right with their right flank anchored on…nothing. It was a terribly exposed position and, realizing this, the men began throwing together improvised breastworks as quickly as they could. Confederate artillery fire soon opened on them. Then, at about 6:30 p.m., Wright’s Georgia Brigade, about 1,500 strong, bore down on the two regiments, together numbering scarcely 700 men. According to Private Roland Bowen of the 15th Massachusetts, when the Georgians charged, “With a shout we sprang up on our knees and resting our muskets over the rails, we gave them one of the most destructive volleys I ever witnessed…they hesitated, then reeled…yet there was no panic.” The two regiments alone could not stop the advance. Worse, the Union batteries back on Cemetery Ridge behind them began to fire into the Georgians…but inadvertently struck many in the 82nd New York and 15th Massachusetts. The New York regiment fell back first. The 15th Massachusetts, now alone, attempted to hold out but could not for long. Col. Ward ordered a retreat. With his prosthetic leg and having sent his horse to the rear, it would be extremely difficult for Ward to make the retreat with his regiment. 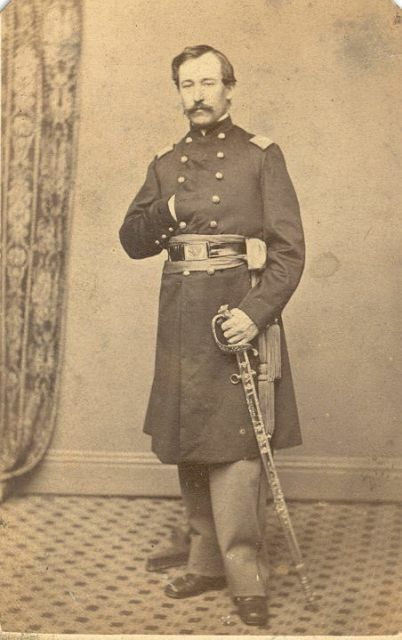 His brother Henry, who was also in the 15th Massachusetts, later wrote, “I felt then, that if we should be obliged to retreat, it would be all up with him.” Col. Ward was shot in the leg as his regiment retreated in some disorder. As the fighting began to die out that day, brother Henry managed to find Col. Ward on the field and got him to a surgeon. But it was too late. Col. Ward had lost too much blood and died around sunrise on July 3 in a field hospital near Cemetery Ridge. He was one of three Massachusetts regimental commanders killed during the Battle of Gettysburg. General Gibbon later commended the two regiments for their service in preventing the Confederates from cutting off the III Corps from the rest of the Union army. On the morning of July 3, the 15th Massachusetts occupied a position roughly 200 yards south of the Copse of Trees on Cemetery Ridge. They spent that morning building crude breastworks using whatever they could find and lay down behind them in expectation of the coming attack. Shortly after 1 p.m., the tremendous Confederate barrage on the center of the Union line began. Units up and down Cemetery Ridge hunkered down as best they could. When the guns stopped and the great lines of Pickett’s formation appeared, it seemed at first as if the assault was coming directly at the position of the 15th Massachusetts and their brigade. However, the advancing column obliqued and moved slightly off to the Union right, aiming for the Copse of Trees and what is now known as the Bloody Angle. The men of the 15th Massachusetts saw the Union lines breached to their right and saw the Confederate battle flags mingling with Union colors, moving over the crest of the ridge. Harrow’s Brigade, including the 15th Massachusetts, along with other adjacent brigades, crushed into the breach. Military order was almost completely lost as regiments and brigades mingled, striking the right flank of what was left of Pickett’s men like a tremendous mob. In a short time, it was over. During the Battle of Gettysburg, the 15th Massachusetts lost 22 killed, 93 wounded, and 28 missing or captured–a casualty rate of 60%. Sadly, it was the highest casualty rate of any Massachusetts unit at Gettysburg and among the highest in the overall battle. This entry was posted on Thursday, July 2nd, 2015 at 4:00 pm	and tagged with 15th Massachusetts Infantry, Battle of Gettysburg, George Hull Ward and posted in American Civil War. You can follow any responses to this entry through the RSS 2.0 feed.